Following in the footsteps of other great Canadian and local, LA based, artists Brenna will be performing at the legendary Hotel Cafe in Hollywood. At only 16 years of age, Brenna will be among a small group of emerging artists to perform and showcase her original songs at this CD release event. Accompanied by many of the veteran musicians who played on her album, Brenna will be performing all of her, Jazz & Soul inspired, original songs from her new EP entitled “ I’ll be fine”. 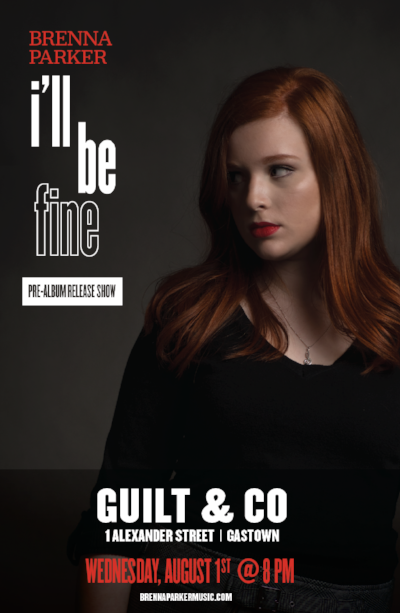 Brenna will be appearing, with band, to perform at Vancouver’s Guilt and Company Lounge. Located in historic Gastown, this intimate live music bar was chosen as the perfect space for Brenna to introduce and showcase her new collection of, Jazz & Soul inspired, original songs from her brand new EP entitled “I’ll be fine”.